A good, high-capacity machine that had an opportunity to be great, and missed it. 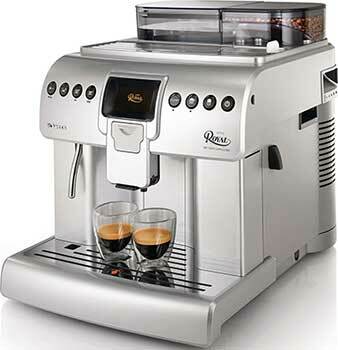 Recommended for: An ideal machine for power coffee drinkers and people new to the world of specialty coffee drinks. Purists will be put off by the relative lack of fine-grained controls. If you’re a true coffee fanatic, are new to the world of specialty coffee drinks, and have money to spend, then you’re going to love our detailed Philips Saeco Royal one touch cappuccino review. This super-sized machine might be perfect for you. It’s capable of delivering cup after cup of your favorite coffee drinks. In fact, it’s so big and robust it could even be used in a business setting like a busy real estate office. Having said that, the machine is not without its flaws, and some of them are serious. In the sections below, we’ll cover it all: The good, the bad, and the ugly, so you’ve got all the information you need to make an informed purchasing decision. Let’s get right to it then, and see what this machine can (and can’t) do! 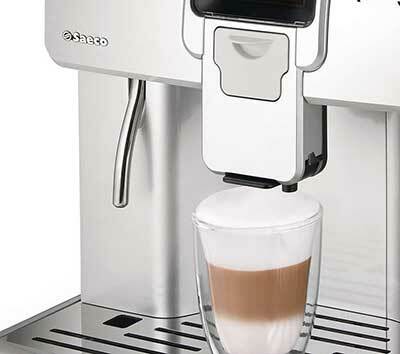 The first thing you’ll notice about the Saeco Royal espresso machine is its size. It’s fairly burly in terms of its footprint, measuring an impressive 20” x 15.2” x 19.7,” and it weighs in at an equally impressive 39.2 pounds. Right out the gate then, it’s safe to say that if you have a smaller kitchen, limited countertop space, or low clearance between your counters and cabinetry, you may have to give this model a pass, simply because you won’t have anywhere to put it. Given its weight, moving it from one place to the other is certainly possible, but it’s probably not something you’ll want to do on a regular basis. Assuming you’ve got the counter space and clearance for it, however, it will make a striking addition to your kitchen. Dressed all in silver, and constructed of a mix of sturdy ABS plastic and stainless-steel, with a rugged, modern industrial design, you can tell just by looking at it that it’s a real workhorse. It’s not exactly elegant, but it’s not unattractive, either. It simply looks like it’s got a job to do and it means business! We’re coffee fanatics, consuming oceans of the stuff every week, and because of that, we tend to take a dim view of and deduct points from models that offer a small water reservoir. We certainly didn’t have to knock any points off of this beast, with its impressive 74-ounce, top-loading water tank. The fact that the water tank is removed via the top of the machine may further complicate your efforts to find a good home for it if you have limited clearance between your countertops and your cabinets, because of course, you’ll need to allow some additional room to access the tank when it needs to be refilled (which thankfully, due to its impressive size, isn’t all that often!). Note that the water tank does not utilize a filter. We’re okay with that, but we’d recommend using distilled water to cut down on the amount of descaling you’ll have to do. There’s quite a lot to talk about here. 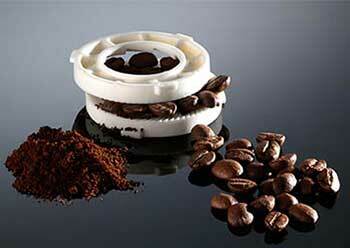 First and foremost, the Royal Saeco coffee machine utilizes a top of the line ceramic burr grinder. This is far superior to less expensive stainless-steel grinders for one reason. Stainless-steel grinders tend to heat up when you use them, which can sometimes lead burning the grounds, which in turn, will completely ruin the flavor of your coffee. Not good. Ceramic grinders don’t have that problem. The grinder also holds a lot of beans, which we love. You can load it with up to 12 ounces, making it well-paired with the size of the water tank. One gripe we have with some machines is that they offer a very large water tank, paired with a small bean hopper, or vice versa. That’s problematic because if there’s a size mismatch, then you’re constantly having to stop what you’re doing to refill one, or the other, or both. Happily, the Royal One Touch avoids this problem! Another thing in the Philips Saeco Royal HD8930’s favor is the fact that you can adjust the grind settings via a lever located on the right side of the machine. That’s a significant improvement over many of Philips’ other models, which require you to use an adjustment wrench every time you want to change your grind setting. It’s something we’ve complained about before, and we were thrilled to see the company take a different approach with the Royal! It’s not something you’ll notice if you’re the only coffee drinker in the house and if you don’t change what you’re drinking very often, but if you’ve got a house full of coffee fanatics, then odds are that everybody will want a different grind, which means lots of people reaching for the wrench, which of course, will invariably get lost in the shuffle at some point. Another curiosity that bears special mention is the fact that there’s a second lever on the right-hand side of the machine, which is your dosing control. This is unusual. Most of the time, you can adjust the strength of your coffee in the menu system of the control panel, along with every other feature. That’s not the case here. For whatever reason, the company made the decision to put this adjustment next to the grinder controls. It’s not a good or bad thing really, it’s just different. If you’re scratching your head wondering why you can’t find the menu option to adjust the strength of your coffee creation, this is it. It’s not on the menu, but rather, on the side of the machine. If we have one quibble with the grinder, it’s that there are only six grind settings available. For novice users, this is fine, but coffee purists will chafe under this limitation. After all, getting the grind right is one of the essential elements to brewing a great cup of coffee, and everyone’s tastes are different. Six settings just aren’t enough to cater to everyone’s tastes and don’t allow for enough fine-tuning. We regard this as a missed opportunity. An average feature implementation, but not a great one. It’s also worth mentioning in this section that the Philips Saeco Royal Auto Espresso Machine has a one-scoop bypass doser for those times you’d just prefer to use pre-ground coffee. This is a nice addition, but in our view, given the sheer size and capacity of this machine, it would have made more sense to include a bypass doser with a two-scoop capacity. 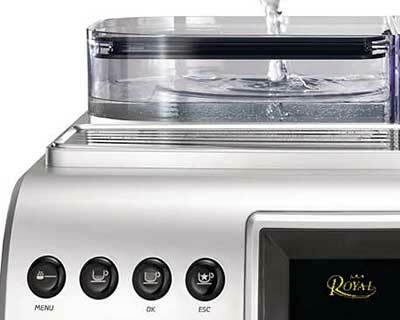 Another selling point for the Royal is the fact that it is a double boiler system. One boiler for your coffee, and a second that’s dedicated to steaming and frothing milk. The chief advantage of this approach is speed and efficiency. 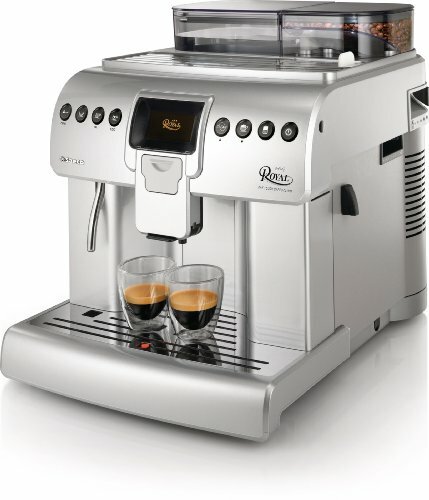 It allows you to simultaneously make coffee and froth milk. If you have a machine with a single boiler, you’ll spend a small amount of time idling, every time you create a milk-based drink, as you wait for the boiler to switch between milk steaming temperature and coffee brewing temperature. It’s not hugely time-consuming, but if you drink lots of coffee, then you’ll want a machine with a double boiler. The dual coffee spigots do telescope up and down to accommodate a variety of cup sizes, but fair warning: You’ll want to use wide-mouthed cups if you’re making a milk-based drink with this machine! That’s because of the position of the milk spigot in front of the coffee spigots. Be careful how you position the cup beneath the spigots when you’re making your first couple of drinks, or you may lose either the coffee or milk to the drip tray and have to start over! This is the key component of the whole system. The brew unit is where the coffee making magic happens, and the control system is your window into it. As you might expect, there’s a lot to say about this topic, especially on a top-end model like the Saeco Royal super automatic espresso machine. First and foremost, while some machines don’t allow you to remove the brew unit for cleaning, this one does. 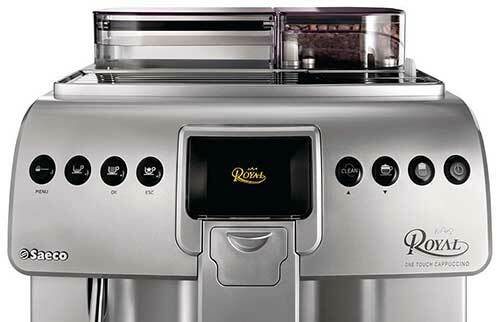 You can access it from the right-side panel, just below the levers that control your grind setting and dose size. 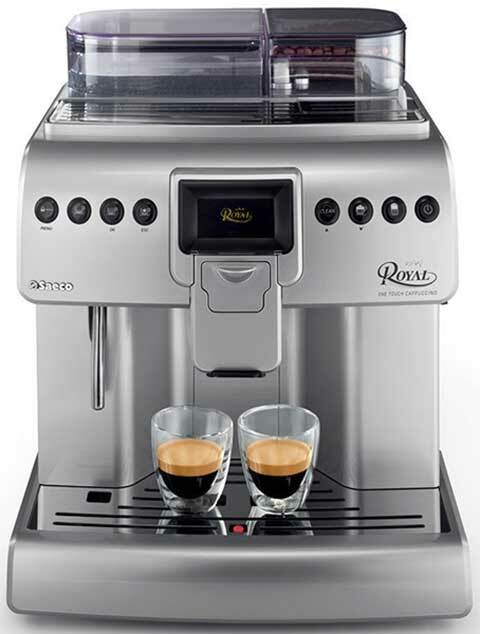 Note that the Saeco Royal espresso machine manual also has a separate drip tray beneath the brew unit, so be sure to take both out for a good, weekly cleaning. Plenty of choices, and as you dig more deeply into the settings of each drink, you’ll see that you can adjust all the settings to taste, with the notable exception being that there’s no option to set the amount of beans per shot. As we mentioned earlier, that’s because the strength setting has been moved from the menu, where you’d traditionally find it, to a lever on the right side of the machine. 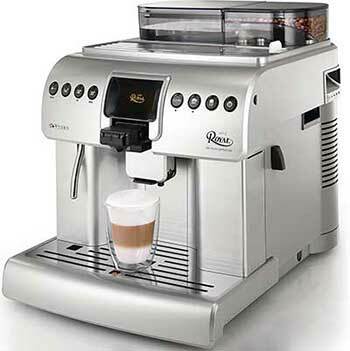 The Saeco Royal One Touch cappuccino super automatic espresso machine utilizes an auto-frothing system. There are two ways this feature can be implemented. A dedicated milk carafe can either be plugged directly into the machine, or it can employ a length of plastic tubing you feed down into your milk container. Whichever implementation is used, the milk is sucked from the container into the boiler, where it is heated before being dispensed from the milk spigot. On the Royal, the milk spigot plugs into the front of the unit, quite some distance from the coffee spigots. In our view, this is a poorly designed and implemented feature, not only because we don’t like using the plastic tubing, which makes your fancy machine look a bit like a high school science project, but also because it requires you to use a cup with an exceptionally wide mouth if you want to catch both coffee and milk. It’s not awful, but it’s certainly not optimal. While it’s true that you can adjust the amount of milk and froth you get in any milk-based drinks, coffee purists will bemoan the loss of a proper frothing wand for more control over that part of the process, and sadly, you can’t attach a frothing wand to the metal spigot on the left side of the front of the machine. That’s just for hot water. Note that the company makes a stainless-steel milk carafe designed for use with this unit, and periodically, if you watch for sales, you’ll find this included at no extra charge. If you’re new to the world of specialty coffee drinks, at this point, we need to say a few words here in our Philips Saeco Royal one touch cappuccino review about how espresso is made and how the process differs from the coffee you’re used to. Most likely, you’re used to drinking coffee by the pot, made in a drip-brew coffee maker. These machines rely on simple gravity for their operation. The grounds chamber is flooded with water, which slowly drips through the grounds and into the waiting pot. There’s a very different system at work in the Saeco Royal, and other super-automatic machines. Here, the coffee is forced from the spigots under pressure, which is measured in bars. One bar of pressure is equal to atmospheric pressure at sea level. The Saeco Royal’s pump is rated at an impressive fifteen bars, so you won’t have any difficulty getting consistently excellent espresso from the machine. There’s not a lot to say here, except to make a note of the fact that the Royal has a cup warming tray, located on the top of the machine. The tray does not have a dedicated warming element, but rather, is heated passively via heat from the boilers. Specialty coffee drinks were meant to be enjoyed at temperatures lower than what most American coffee drinkers consume their drip-brewed coffee, and the temperature difference can be a little jarring. While the espresso and coffee you get from the Royal is hot enough, if you set the temperature to its highest setting, any time you make a milk-based drink, you’re apt to notice a significant temperature difference. This is simply because milk can’t be steamed at extremely high temperatures without ruining its flavor, and when you mix the cooler milk with your hot coffee, it’s going to lose some of its heat. If you dispense your drink into a cold cup, it will lose even more. The cup warming tray is your workaround to this problem. Pre-warm your cup, especially when making a milk-based drink, and you mitigate the heat loss for a hotter, more satisfying drink. Try it both ways. You’ll be amazed at the difference using the cup warming tray can make! 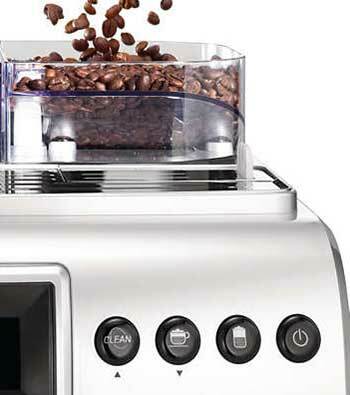 We’ve already talked about the weaknesses of the Philips Saeco Royal auto espresso machine model hd8930’s interface, and those weaknesses translate directly into making the machine more difficult to use than it needs to be. Had the Royal One Touch been given a more modern display screen, it would have paved the way to a more intuitive interface. That holds true to the cleaning submenu as well. Once you know where they are, these are simple to execute, but again, owing to the cumbersome menu system, you’ll feel like the machine is actively trying to hide its features from you in the beginning. There are, of course, several bits of routine maintenance that are not automated. The weekly removal and washing of the brew unit and its dedicated drip tray. Periodic descaling, keeping the dregs box and drip tray empty, and so on, but the biggest drawback concerning cleaning comes with the auto-frother. After you make a milk-based drink, you’ll be prompted to run a quick rinse cleaning cycle, and you should absolutely do that. The problem, however, is that the quick rinse doesn’t include the length of plastic tubing. To clean this, you’ll need to remove it both from the machine and from your milk container and hold it under the sink to give it a thorough rinse. We’ve seen other machines implement this feature such that a hot jet of steam or water shoots through the tube during the cleaning cycle, making all this unnecessary, and we dearly wish the Royal had included something similar. It was apparent that they knew this was a design flaw too because when you unpack the machine, you’ll find that they have included a second length of plastic tubing for use while you’re manually cleaning the first one. It’s just poor design, in our view. As you can see by this point in our review, there are several things we like about the Philips Saeco Royal cappuccino machine, and several things we just don’t. Its greatest strengths are the massive size of the water tank and the fact that this is well-paired with a generously sized bean hopper. No matter how much coffee you drink during the day, this machine can keep pace with you. These features also make it the ideal machine for large household or even light business use. If you own a real estate office, auto repair shop, or similar, this can be a great addition to your office, and it’s robust enough to keep up with the demand. It can make a variety of specialty drinks, and there are enough customization options to keep novices and casual coffee drinkers happy. The Royal needs a better milk frothing system, and the option to add a frothing wand. No user profiles. This is a real head-scratcher. It’s obvious that this machine was designed to be used in large households and high traffic areas, and yet, there are no user profiles, which makes it impossible for each person to save his or her preferred drink settings. A real lost opportunity, in our view. And that’s a wrap for our Philips Saeco Royal One Touch Cappuccino review. Even with its various shortcomings, there’s no denying that this is an awesome machine. Although you’ll probably never love the interface, if you can make peace with it, this model has a lot to offer. As such, we recommend it for hobbyist and casual users, and those who are relatively new to the world of specialty coffee drinks. Coffee purists will be underwhelmed. Saeco HD8930/47 Quick Start Guide. How to Find High Quality Coffee Beans. Coffee Brew Guides. The Art of Making Espresso. 1st in Coffee.